It's important as any pet owner to handle your pet correctly to avoid injury to yourself and them. For Chinchillas, this is just as important as it is for you. Chinchillas have very delicate bones, and squeezing or dropping can cause fractures and breaks very easily. More often than not, Chinchillas do not prefer to be handled. By nature they are prey animals, and have the urge to flee when caught and held. This can result in fur slip if handled roughly. "Click" here to read more about fur slip. The safest way to handle your pet chinchilla is to get your pet's attention so they do not become shocked when you touch them then to firmly grasp your pet at the base of the tail. Lift upwards and slide your free hand under their belly to support their weight. From here you can bring your pet in close and loosely hold them against your body, or carry them as is. For their first few attempts at handling your pet this way, you may cause mild fur slip. This is especially common with owners new to this way of handling or Chinchillas who have never been handled properly. Because it's a strange new way of being handled some chinchillas will let out a screech because they're scared. This is when it would be best to bring them in close and loosely hold them to show them that you are not trying to hurt them. After practice, you and your pet will begin to feel comfortable. You should still approach them and make yourself known so you do not frighten them. Firmly grasp the base of the tail and lift them up. Do not stick your hand under the belly, because an aggressive chinchilla may reach down and bite you in an attempt to be freed so they can escape. 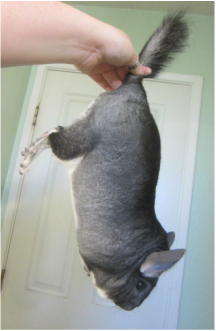 Instead, hold the base of the tail firmly ( the chinchilla should not be able to reach your hand this way ) and place the chinchilla in his/her cage or carrier. If you are going to set the animal down, lower him/her till their front paws touch the table, then release their tail. If you need to look at the animal, you can do so holding them up, or setting them on the table while still holding the tail. This prevents the animal from jumping away from you. When handling a sick or injured chinchilla, you should be extra careful not to add more stress to the situation. Be cautious not to cause more damage to any injuries the animal may have. It's important not to handle a sick or injured animal unless necessary to go to the vet or administer treatment. A sick or Injured Chinchilla may be less willing to be handled with increases your chances of being bit, so take caution. 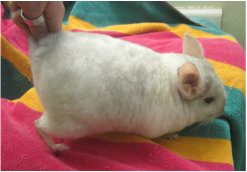 Pregnant Chinchillas should not be handled often to avoid causing harm to the growing kits inside nor should they have play time. 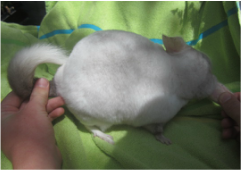 However, when needed a pregnant chinchilla should be handled by firmly gripping the base of the tail and supporting her weight with your free hand under her chest. Avoid gripping or applying pressure to the abdomen as doing so could injure the kits. If the chinchilla is too stressed or wiggles too much it's advised to return her to her cage to avoid injury. Handling a kit is much easier than handling an adult chinchilla, but a kit is much more delicate. It's still recommended to hold them by the base of the tail if you will be more than 12" off the ground. A fall any further than 12" can be fatal for a Kit. Normally, you can just scoop a kit up with your hands. They are very energetic and are known for jumping so please sit on the ground when you handle a kit. For one reason or another you may have to immobilize a chinchilla. This could be to perform a hair ring check, to administer medicine, etc. There are 3 methods to safely immobilize a chinchilla. Hold your chinchilla by the base of the tail while allowing your pet to keep all 4 legs on the table. Hold the tail low to the table to prevent jumping. This is best for taking temperature by ear, checking ears, checking gender, or to feel the animal for any abnormalities. Firmly grasp your chinchilla by the base of the tail and by one or both ears. This keeps your pet from jumping or squirming. This is best to keep your pet still to tag ears, clean wounds, or take a rectal temperature. 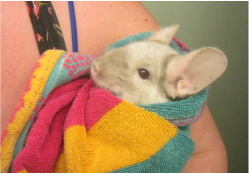 Wrap your chinchilla up in a towel, not too loose that they wiggle out, but not so tightly that they cannot breath. This is best for administering medications, force feeding, to check ears, and to check teeth. Firmly grip the base of your chinchilla's tail. Then with your free hand place your thumb and index finder on the back of the neck. Firmly grip the nape of the neck ( be careful you don't just have fur ) and release the tail. This is similar to how you would nape a cat. 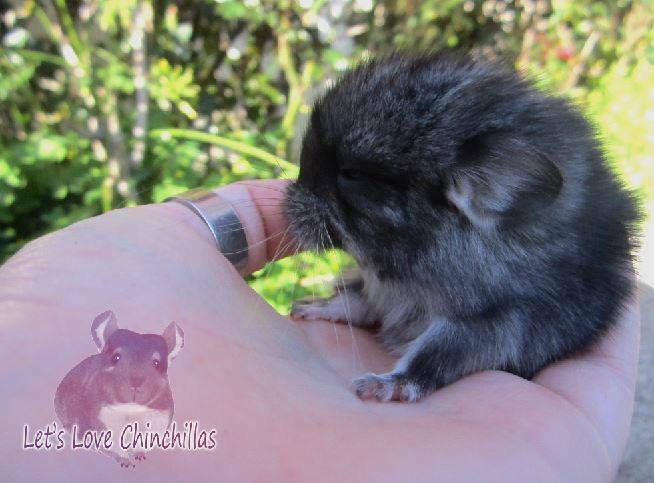 Some chinchillas wiggle, and when they do you should firmly grip the base of the tail. Then rotate your arm to flip your chinchilla on it's back. This is best for checking wounds on the underside, performing hair ring checks, administering medication to stubborn animals, force feeding, checking feet and checking teeth. Practice makes perfect with this method. If done incorrectly, there will be a lot of fur slip. 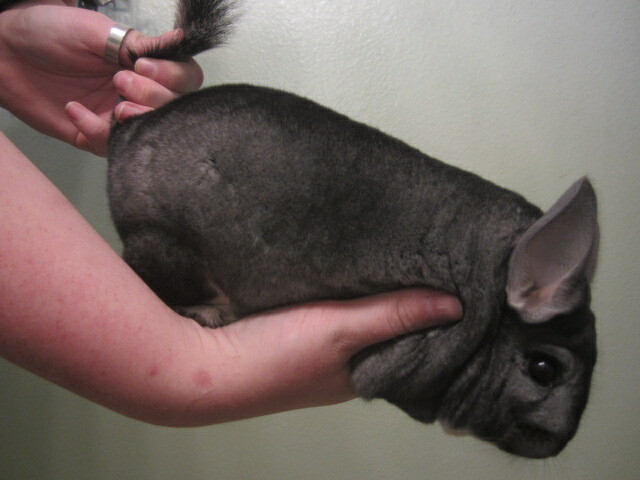 A chinchilla being handled incorrectly, or roughly will try to get loose by wiggling , kicking, and squealing. A vocal chinchilla may be scared or uncomfortable. Do your best to keep your chinchilla calm, and try to position your hand in the most comfortable place for your pet. Holding the center of the tail will result in a fracture or break. Holding the tip of a Chinchillas tail will result in a disconnected bone or the tip will rip off. Always handle gently by the base of the tail.